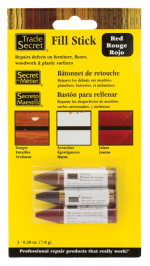 Crayons are for drawing pictures, but if you want to properly repair deeper nicks and gouges in your finished furniture, wood surfaces and flooring, Trade Secret Fill Sticks are what you need. 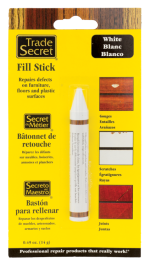 The 100% wax formulation sets the Fill Sticks apart from your run-of-the-mill putty stick that is too greasy to top coat with paint or other finishes. With our wax formulation there is less shrinking versus putty stick repairs as well as a more colourfast solution. 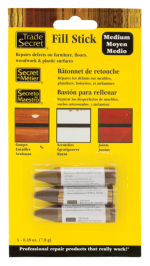 Simply rub into the repair and wipe off the excess. The wax will fill and form to the contour of the surrounding area! 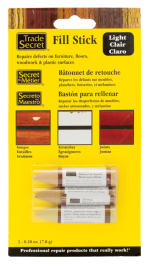 The Trade Secret Fill Stick wood tones come conveniently packed in a trio format that ensures you get the right colour every time. Save the hassle of returning or exchanging at your local hardware store. 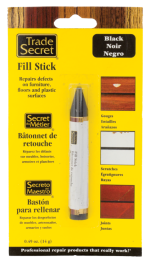 Whether repairing dining tables, floors, kitchen cabinets or even melamine countertops, the Trade Secret Fill Stick gets the job done. 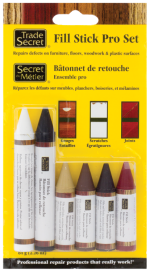 Not available in Hot Magenta™, Purple Mountain Majesty™ or Atomic Tangerine™. Sorry.